My roots are based in words. Before I started to develop Poetic Art, I focused on writing poetry that often resulted in published poems or spoken word pieces. To me, there is a simplistic beauty in language – in words that are strung together to make inspiring thoughts and emotions come to life. My love of words has inspired me to start developing word art prints or typography art prints. Pieces that focus solely on the raw beauty of words and type. So far, I have developed 10 new art prints based in this style and I am pleased with the result. I hope that my loyal Poetic Art fans will hold an appreciation for these pieces in the same way that I do. They present a unique and inspirational option for those looking for home or office decor that is sometimes best enhanced with the beauty of pure and thoughtful words. These new pieces are available as 13×19 paper prints or 11×14 canvas prints. 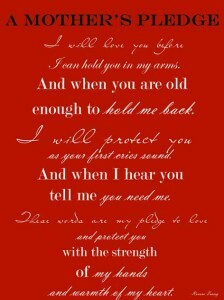 One of my first typography art prints is called a Mother’s Pledge. I wrote this piece many years ago, before I was blessed to become a mother. You can view more of my typography word art prints here.